Matthew was probably born in Galilee and was a publican tax collector at Capernaum at the time that Jesus called him. While a tax collector was a rich man, he was no more admired in ancient times than an IRS agent is admired today. The fact that Jesus chose a tax collector as a disciple shows us that he was bringing the Good News not just to the Pharisees and other self-righteous Jews, but also to the rejected people of society. Matthew was one of the twelve Apostles, and the second Gospel is attributed to him. His Gospel was written sometime between the years 60 and 90, most likely in Aramaic. (The historian Papias records in 130 that Matthew wrote the Logia, presumably our Gospel, "in the Hebrew Tongue".) The Gospel which we have now came to us in Greek and, at the very least, is a thorough and substantial revision of the original Aramaic, of which no traces have ever been found. Without question, the Gospel credited to Matthew was written by a Jewish Christian of Palestinian origin for Jewish Christians. The goal of Matthew’s Gospel was to convince the Jewish people that Jesus was the Messiah, that the old covenant between God and the Jewish people was being replaced by a new covenant through Jesus, and that everyone, not just the Jewish people, was included in God’s plan for salvation. Of the four Evangelists, only Matthew presents Jesus as a second Moses, or as a lawgiver. To the Jews of that time, the law was paramount and Matthew strove to represent Jesus as the fulfillment of the Scriptures. He gives an account of Jesus’ lineage and draws several parallels between events in the lives of Moses and of Jesus. In his account of Jesus’ birth, for example, Matthew tells of how Herod’s jealousy and hatred forced Joseph to take his family into exile in Egypt. In this way, Jesus, like Moses, came out of Egypt to save his people. According to Tradition, Matthew preached in Judea and then went to the East and to Ethiopia, where he suffered martyrdom according to the Roman Martyrology. 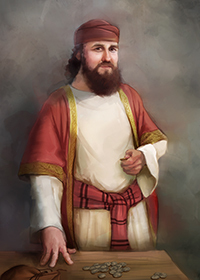 Another legend has Matthew martyred in Persia. Saint Matthew is the patron saint of accountants, bankers, and bookkeepers. He is honored by a Feast celebrated on September 21. Matthew's message today: Matthew, probably the best educated of the Apostles, builds a logical case for Jesus as the Messiah to the Jewish people. In writing this Gospel, he shows a broad knowledge of what we today call the Old Testament. We all need to develop a familiarity with the Scripture if we are to understand the basics of our faith. Do you read Scripture on a daily basis? Have you considered joining a Bible study group?